As part of Frieze Week Christie’s will present Un/Breakable, a curated Evening Auction dedicated to Modern and Contemporary ceramics. Paul Gauguin was among the first modern artists to elevate the medium to the realm of high art. Recognising the medium’s vitality, he strove to liberate it from the domestic world of ornament and decoration. For some artists – as with Takuro Kuwata, who gives a postmodern twist to Japanese tradition, or Luigi Ontani, who dialogues with kitsch and Classical idioms – ceramics allow a reframing of art history, and an exploration of where the decorative and the artistic intersect. In the 1980s, Julian Schnabel used broken plates to return to the heroic scale and physical ambition of Abstract Expressionist painting. Other artists, including Rosemarie Trockel and Nermin Kura, engage directly with clay’s tactile, biomorphic and bodily qualities as they take a fresh look at the cultural and aesthetic values embedded in material. Further artists include Lynda Benglis, Pablo Picasso, Lucie Rie, Alev Ebüzziya Siesbye and Thomas Schütte. Paul Gauguin was an artist with an indefatigable need for discovery. In 1886, shortly before he left Paris for his first seminal trip to Brittany, Gauguin began to produce ceramics, having been introduced by his friend to Ernest Chaplet, one of the leading ceramicists of his day. Vase porte-bouquet (“Atahualpa”) (executed late 1887-early 1888, estimate: £120,000-180,000) encapsulates Gauguin’s innovative, highly expressive and unique mode of ceramics. Instead of following the traditional technique of throwing pieces on a potter’s wheel, Gauguin preferred to construct his ceramics by hand. This practice, he believed, was essential to a new, avant-garde form of ceramics. The self-styled ‘Mad Potter of Biloxi’, George Ohr defied all convention. He created a prolific, diverse body of work in the late 1890s and early 1900s that was astonishingly ahead of its time. Glazed ceramic vase(executed circa 1900, estimate: £6,000-8,000), with its exuberant biomorphic shape, fringed lip and shimmering, mossy glaze, is a charming demonstration of his pots’ unique character. Executed in 1959 as part of his teatrini (puppet theatre) series, I Gessetti (estimate: £250,000-350,000) is an early example of Fausto Melotti’s figurative terracotta works. It is a diorama divided into two distinct levels and on each ‘floor’ a softly modelled figure sits sideways, knees bent, calmly lost in thought. In the lower level, Melotti has placed a small table and covered it with the titular chalks which provide the only colour in an otherwise serenely monochromatic tableau. Born and raised in Istanbul, Alev Ebüzziya Siesbye, the Turkish-Danish artist formed her artistic identity in the studio of important workshops such as Eczacıbaşı Ceramic Factories and, later, Royal Copenhagen. 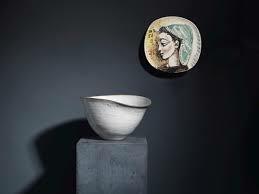 The precision of shapes and colour she achieves, as in Tall bowl (2000, estimate: £9,000-12,000) are the result of a complex and precise process of creation and a deep understanding of space, colour and texture. Lynda Benglis rose to prominence during the 1960s for her series of vibrant ‘pours’, for which she spilled coloured latex directly onto the floor. Part painting, part sculpture, the ‘pours’ result in amorphous and spontaneous contours, and this technique with its emphasis on chromatic materiality, would influence her future ceramic works. Metal Force (1993, estimate: £25,000-35,000), is a verdant, organic figure form bursting with life. Ceramic Sketch (1999, estimate: £70,000-100,000) and Ceramic Sketch (1997-99, estimate: £70,000-100,000) are maquettes for Thomas Schütte’s Frauen (Women), an important series of large-scale steel, bronze and aluminium works in which the artist deconstructs – and subverts – the language of monumental sculpture. The small ceramics are a key part of his process, allowing an expressive, three-dimensional immediacy of creation. Integral to Schütte’s exploration of sculptural tradition is the plinth, which typically confers a certain power and gravity upon the figure that it supports. Each of his maquette women is fashioned from a single piece of clay together with her base, conceiving the two as indivisible. The present two works display Schütte’s playfully disruptive approach to this convention, as well as a delightful use of colour. In Nermin Kura’s sensual ceramics, enlarged and imaginary flowers burst forth, as in Moon Slippers (2015, glazed 2018, estimate: £5,000-7,000). Glazed entirely in glossy white, it unfurls like an orchid, at once curved and triangular. Upon each of the three cascading petals sits a distinctively shaped bud. Moon Slippers evokes the same fascination with a bodily, organic beauty as Georgia O’Keeffe’s paintings.